« Is Norway a Role Model for “Democratic Socialism”? Combined with the state’s requirement for a balanced budget, this means Colorado has a de facto spending cap (similar to what exists in Switzerland and Hong Kong). P.S. 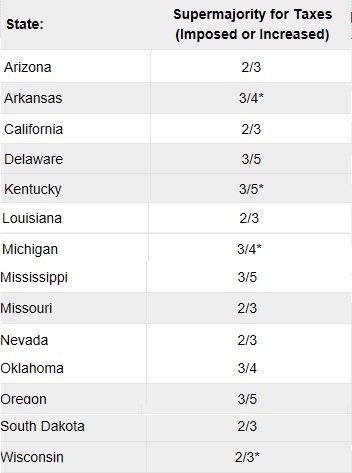 It’s not a fiscal rule, but the best tax policy for a state is to have a zero income tax. The second best rule is for a state to have a flat tax. Indeed this is likely why we have pitchfork taxes concentrated on the rich. Better not become one. Get a handful of million and then get out. Fish by the lake, play guitar with your friends, yoga in the morning, golf in the afternoon, and you may spare yourself the pancreatic cancer. I myself I’m only a partime resident of Silicon Valley. But what about all the jobs that these competent but inconspicuous dropouts could have created all over the nation? Ahh let them eat tofu. The Silicon Valley sticker shock comes from another unrestrained ubiquitous yet little understood by most people form of coercive collectivism: regional planning and restrictive zoning fed by a pervasive culture of enviro-nimbysm. If you look at a google earth image of Silicon Valley you will see that only about one quarter of its land is actually developed. Yet with only half a percent (yes that is just 0.5%!) of the earth’s surface being urbanized we must save the earth by not building any more housing in Silicon Valley. Here in Silicon Valley we are actually forced to pay extra levies through our real estate taxes for the unique special purpose of purchasing undeveloped land and placing it permanently out of circulation. And we actually have huge swaths of land in Silicon Valley (Santa Clara county) zoned to sixty acre minimum lots if you can believe it ! Then the regional planning authority prevents new cities from being formed just outside Silicon Valley to keep the residents cordoned inside the urban boundaries that a bureaucrat drew on a map while the voter-lemmings applauded. The end result is housing that costs 20-30 times annual income; European conditions. Then this exorbitant price of housing permeates everything else, of course. When you hire a gardener he too charges you thirty five dollars an hour because he too has to live in million dollar housing, and he’s still broke most of the time unless he shares a small house with two other families. The only silver lining to this misery and repression is that these Silicon Valley lemmings are now paying me exhorbitant rents — and they don’t even realize that they dug their own graves. There’s a bit of shadenfreude in having the very children of hippy enviro-nimbys pay me forty percent of their high salaries in rent. A lot of them, in spite of the college and graduate degrees, burn out after a decade or so, or want to start a family and realize they cannot here, so they leave with nothing to show for it. They’ve spent all their earnings in rent and the other high costs which all stem from housing supply restriction. It’s bizzarre and pathetic, yet it’s almost entertaining. It’s nothing new to me though. I’ve seen this script play out in my native countries of Europe. I know what’s coming and it isn’t pretty. Zorba, my son recently moved to Silicon Valley and is experiencing ‘sticker shock’ over high prices. This is a very good question. And it’s the same question as pondering “why do we need constitutions?”. Or do we? Another way to ask the question is : Do voters need to be protected? From themselves? I imagine that people who occupy themselves with constitutional law must have pondered these issues several times. In summary, I think we, as voters, recognize that at some point we will be tempted to form a majority on “something” and oppress some minority. We don’t know what this “something” is a-priori, but we’re afraid it may be us who end up being in the minority. Therefore we draft rules ahead of time and agree to not fall into the temptation to circumvent them, in exchange for majorities not ganging up against us in similar issues. This is essentially the spirit of every article in the constitution. We recognize, for example that at some point we may be tempted to try to outlaw someone’s speech which we find revolting, so we give up that right to oppression so that we may not one day fall victims of this very oppression ourselves. Pitchforks have short memories. PS. 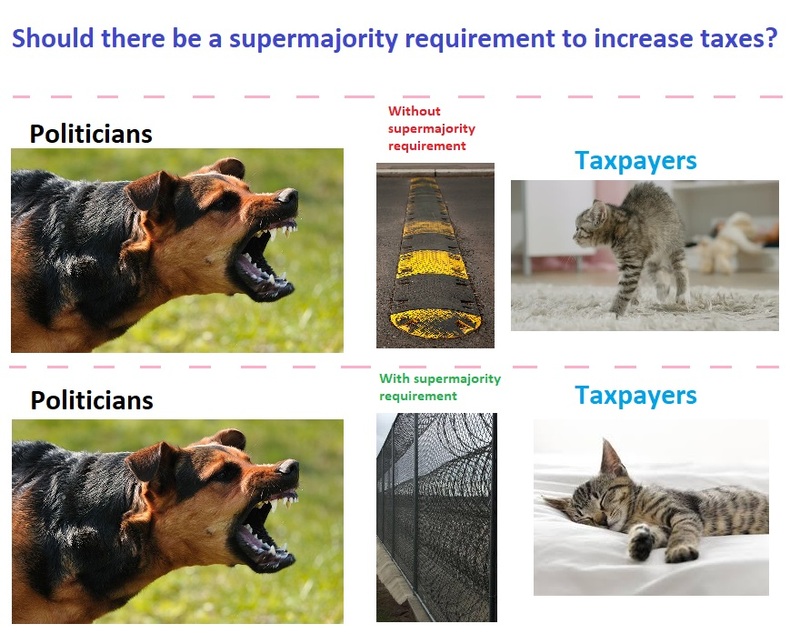 I think [supermajority] is more akin to super gluing the cookie jar lid because you’re obese. That way when you get the munchies in the middle of the night you’re less likely to go through the trouble of smashing the jar and dealing with the broken glass — and you hope you will be more rational by daytime. PS. Can you imagine where California would be without their supermajority rule? These are supposedly the most educated and competent people in the nation. Coercive collectivism truly is wired in our DNA. PPS. I wish voters were smarter, rather than lemmings. Then all that would be superfluous. Alas, they are not, so Darwinian selection takes over. Those countries who (most often serendipitously) limit voter power the right way, that is, those countries that draft the right constitutions, prosper. The others are overtaken by those more successful, sometimes through peaceful means, sometimes not. And as everything human is now moving at breakneck speed in this early twenty first century — and accelerating — this reshuffling of country prosperity rankings will happen faster than ever, and accelerating.